Five athletes from Cal football, including one defensive, two offensive and two special teams players have been nominated to 2017 player award Watch Lists. Redshirt seniors James Looney, Matt Anderson, Ray Hudson, graduate transfer punter Steven Coutts and redshirt junior Addison Ooms are all on the radar as top players in the nation. 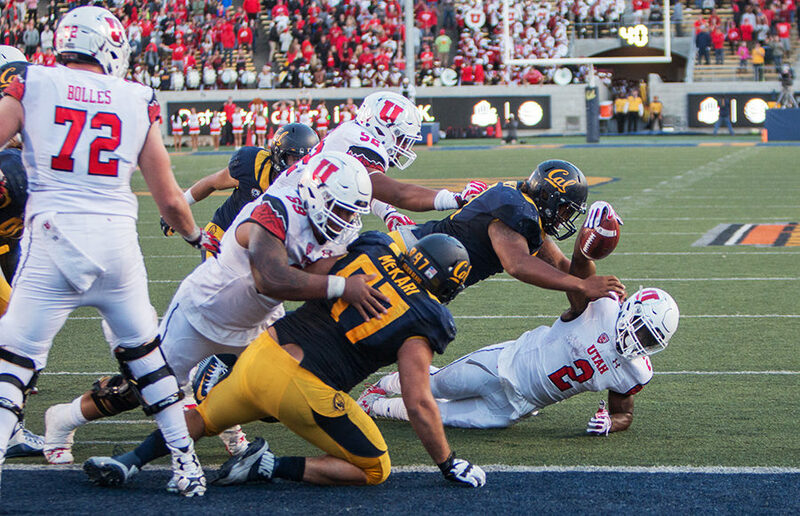 One of Cal’s starting defensive ends, Looney is on the Watch List for the 2017 Bronko Nagurski Trophy. This award recognizes the most outstanding defensive player in college football. Looney has totaled 89 tackles, 11.0 tackles for loss and 4.5 sacks in his two active seasons with the Bears which put him on the map as a top defensive weapon throughout the country. Last year, Looney also recorded two quarterback hurries, one fumble recovery and one forced fumble. The honor has been awarded annually for over 20 years and is named after two-way player Bronko Nagurski who is a charter member of both the College Football and Pro Football Halls of Fame. Looney is also a national preseason honors candidate for a number of other awards, including honors for the nation’s most outstanding player overall as well as its top defensive player, defensive end, defensive lineman and interior lineman. Anderson, interchangeable starting kicker for kickoff and projected starting place kicker, has been nominated to the 2017 Lou Groza Collegiate Place-Kicker Award Watch List. Anderson was a national semifinalist for this same award in 2016. Anderson has played in a total of 26 games with the Bears and is the current active leader in scoring with 221 points. 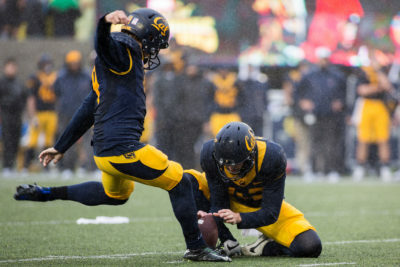 He led the Pac-12 in scoring among kickers, with 117 points after kicking 22 field goals and going 51/51 on PATs. Anderson was responsible for just over a fourth of Cal’s points in 2016. He ranks 10th on the school’s all-time list and is within 67 points of the Bears’ all-time leader Doug Brien’s record. This award is named in honor of Pro Football Hall of Famer Lou “The Toe” Groza, who played for 21 seasons with the Cleveland Browns. He won four NFL Championships during his career and was named the NFL Player of the Year in 1954. Anderson is the sole representative of the Pac-12 on the Lou Groza Watch list. Projected starting tight end Hudson has been named to the 2017 John Mackey Award Watch List for the honor of the college football’s top tight end. The award, given in name of Pro Football Hall of Famer John Mackey, has been an annual recognition since 2000. Hudson is first Bear to be named to the Mackey Award Watch List since 2012, when current Green Bay Packers’ tight end Richard Rodgers cracked the list. Hudson has seen nine starts and played in 34 games in the last three seasons and saw much of his success in his most recent junior campaign. Hudson is one of five representatives from the Pac-12 conference to be named to the list. Coutts has been named to the 2017 Ray Guy Award Watch List, which honors college football’s best punter. Coutts was a semifinalist for the award in 2016 when he played at the University of Louisiana at Lafayette. The Ray Guy Award is a a part of the National College Football Awards Association, which is home to some of the most prestigious awards in college football. Coutts totaled an average of 43.3 yards per punt during his 2015 and 2016 seasons with the Cayennes. 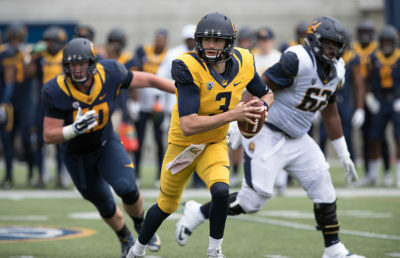 Coutts was not listed on the most recent release of Cal’s depth chart, so his role on the team is not yet set in stone. He is one of five players from the Pac-12 noted on the watch list. Projected starting center Ooms has been named to the 2017 Rimington Trophy Watch List, which honors the nation’s top center in collegiate football’s Football Bowl Subdivision. The award is named after Dave Rimington, who was a first-team All-American center at the University of Nebraska in the 1980s. Ooms is Cal’s first representative on the Rimington Trophy Watch List since 2008, when current Atlanta Falcons center Alex Mack was a finalist for the two consecutive seasons. Ooms is the only Bear on the offensive to start all 12 games last season. He is also one of only two offensive linemen with starting experience from 2016 to return to Cal’s offense. Ooms is one of seven total players from the Pac-12 on the watch list. Cal’s top men to watch will be under close watch throughout the season and final winners will be decided on various dates in December 2017. The Bears will see if their players can rise to the challenge and earn some of the most prestigious honors in college football.